How Much Active Inventory Is On The Reno Market? Earlier this month the Reno/Sparks Assocation of Realtors published the market stats for February of 2013. View Here. The report showed that we have 3.9 months of inventory. For whatever reason (most likely because NAR does it the same way), the Association chose to include pending homes in the mix. 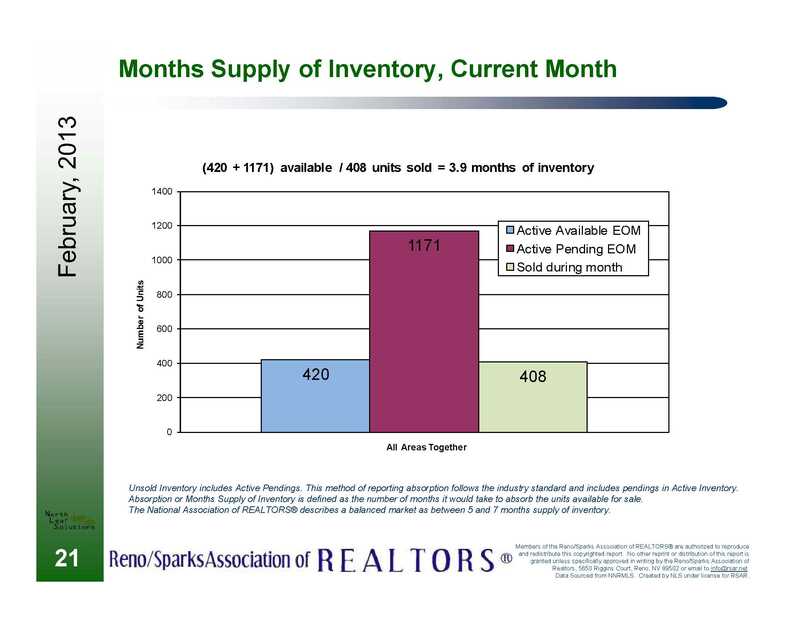 For buyers and seller this doesn’t give a true picture of the amount of active inventory we have. Let’s do the stats in a more realistic way. In a way that buyers and sellers actually see the market. There were 408 units sold with 420 active listings (at the time of report completion). You can view these stats by clicking the picture to the right. So we take 420 actives / 408 solds and we end up with 1.03. That means we have a little over 30 days of inventory. If all new listings stopped tomorrow it would take less than 35 days to clear the market. Now that is a seller’s market. Posted in Market Update and tagged home values reno realtor, reno home inventory, reno house value trulia zillow.com, reno inventory, reno inventory home selling, reno listing agent realtor, reno sellers market, selling home in reno.